The discography of Walter Braunfels’ work is still dismal but, as the example of Weinberg shows us, that can change quickly—it will have to, and it will. There simply is too much great music out there, and many fine musicians tired of the same-old repertoire will find their way to it. Meanwhile, the curious listener has to make do with what little there is, most of which is thankfully of superb standards. If you are unsure about his music, start with the Phantastical Appearances, then the String Quintet. You should be hooked by then and go down either the secular or operatic route first, according to personal preference. The choice here really is one of seeing or just hearing the opera… mine, in this case, is decidedly hearing. As for the seeing, the LA Opera staging looks like a $500.000 high school production, big-budget hokum that might intend to seem naïve, but ends up naff—from the non-existent acting and pedestrian ballet section to the corny makeup and costumes. Musically, Conlon’s LA performance, like Zagrosek’s, is first-rate, except for the poor German of more than half his—Conlon’s—cast. 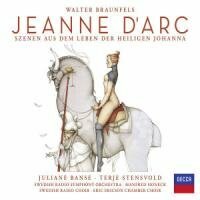 The music is marvelous, but the libretto for this quasi-Magic Flute opera from Braunfels’ early 30s does not match the mature mastery in Jeanne D’Arc. The Decca recording in the Entartete Music series, meanwhile, may be the single most important recording of the Braunfels renaissance. When Manfred Honeck recorded the Te Deum, the Günter Wand recording had not yet been re-issued. When it was, he did not fail to mention it in conversation, admiring it himself. Rightly so, because even the 1952 sound can’t hamper the emotional quality of his—Wand’s—performance. While Honeck’s grasp of the materia and Orfeo’s crisp sound make it the obvious first choice, Wand is the disciple’s pick. The Fantastic (or Phantastical) Appearances was recorded in 2001 by Dennis Russell Davies, who is to be praised for a sumptuous performance on the CPO label, with the Vienna Radio Symphony Orchestra. However, Günter Wand adds a touch of greatness to it in his 1953 recording, which, in good monaural sound with the Cologne Radio Symphony Orchestra, is more bracing and exciting. This might be the recording to listen to. But, just to make it more difficult, Dennis Russell Davies throws in Braunfels’ substantial, very beautiful Serenade for Chamber Orchestra which, in an either-or case, tilts the scales back toward Davies. Both recordings omit the 9th Appearance, which was apparently something of a tradition? The latest recording on Capriccio restores this inexplicable cut. This is not to be missed by lovers of chamber music. The String Quartets, substantive works of somber beauty, have long been out of print but they, too, have come back, in these very fine performances which, shockingly, are the only ones there are on record. Family-friend Wilhelm Furtwängler conducted the premiere of this Catholic concerto, written for the organist and cantor of the St. Thomas Choir of Leipzig, Günther Ramin. With its chorales, it follows stylistically the Great Mass and the Te Deum; the bold and dramatic gestures of the first movement put it in the proximity of heavy German romantics à la Max Reger and Josef Rheinberger before it starts to wax lyrically, leading to the chorale ‘‘Welcome Mother of God, house of God, Purest Light’’. The Symphonic Variations are lush late-romanticism much like the Berlioz Variations. In the late Toccata, Adagio and Fugue, Braunfels pares down his vocabulary to the essential. These two recent additions to the Braunfels catalog are among the finest: The orchestral songs are luscious beauties, performed by top-notch vocalists that give themselves fully the cause and conducted by another splendid Braunfels-apostle, Hansjörg Albrecht (director of Munich’s Bach Chorus).